John Cockcroft won the 1951 Nobel Prize in Physics with his colleague Ernest Walton for producing the first artificial nuclear disintegration in history. Cockcroft & Walton designed and built the first ‘high energy’ particle accelerator. As a remarkable side-benefit, their experiment provided proof that Einstein’s mass-energy equivalence equation E = mc2 is correct. John Cockcroft & Ernest Walton built an electrical transformer to convert low-voltage AC electricity into high voltage DC electricity. They used the high voltage to power the first ‘high energy’ particle accelerator in history. The particle accelerator produced protons moving at very high speeds. The protons smashed into lithium atoms, like high velocity bullets smashing into small rocks. The protons penetrated lithium nuclei, causing them to split into helium nuclei – the first time a nuclear transformation had ever been achieved using artificially produced particles. 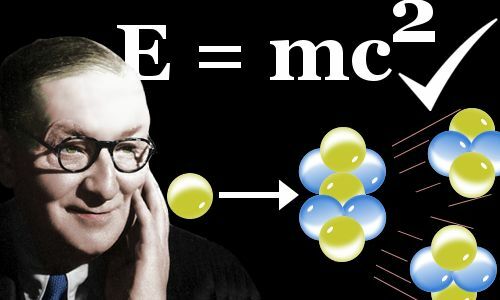 The large amounts of energy released by this nuclear reaction provided proof of Einstein’s famous claim that mass and energy are equivalent, related by the equation E = mc2. John Douglas Cockcroft was born on May 27, 1897 in the market town of Todmorden, Yorkshire, England, UK. His father, John Arthur Cockcroft, owned and ran a cotton mill. His mother was Annie Maude Fielden. John was the eldest of their five sons. From an early age, John Jr. was fascinated by the water wheels and steam engines that powered the local cotton mills. From ages 4-11 he attended the Walsden Church of England School, followed by two years at Todmorden Elementary School, five years at Todmorden Secondary School, where he finished in June 1914, age 17, with a scholarship to the Victoria University of Manchester. World War 1 broke out a month after John Cockcroft left school. He completed a year at university, attending Ernest Rutherford’s Physics course. He was deeply impressed by Rutherford. In November 1915, Cockcroft, age 18, volunteered to serve in the British Army. He became a signaler in the 92nd Field Artillery Brigade, taking part in the Battle of Passchendaele between July and November 1917, in which British Empire casualties (killed or wounded) amounted to almost 250,000. He was mentioned twice in officers’ dispatches from the front for gallant or meritorious action in the face of the enemy. In 1918, Cockcroft began officer training – unusual for those class-conscious times, because he had not attended a private school. In October 1918, he was commissioned as an artillery lieutenant. The war ended a month later and he left the army in January 1919. Cockcroft returned to Manchester to study Electrical Engineering at Manchester Municipal College of Technology, graduating with a first-class Bachelor’s degree in June 1920, age 23. During his degree course, Cockcroft impressed Miles Walker, Professor of Electrical Engineering. Walker recommended Cockcroft to the Metropolitan-Vickers Company as a college apprentice. Metropolitan-Vickers paid Cockcroft to do research work with Miles Walker, carrying out harmonic analysis of voltage and current waves at commercial power frequencies. Cockcroft and Walker published the research, and it earned Cockcroft a Master’s degree in Technology. Walker thought Cockcroft could go far, and suggested he should study at the University of Cambridge for its Mathematical Tripos. Cockcroft won a scholarship and he was also financially assisted by an aunt and by Walker. In 1924, age 27, Cockcroft graduated as a Bachelor of Arts ‘wrangler’ with first class honors, having scored B* in part two of the Tripos. Walker now recommended Cockcroft as a PhD student to Ernest Rutherford, who had moved to Cambridge to head its famous Cavendish Laboratory. Rutherford accepted Cockcroft, and in 1928, age 31, Cockcroft was awarded a PhD for his thesis: On phenomena occurring in the condensation of molecular streams on surfaces. Cockcroft continued as a research worker at the Cavendish. He took inspiration from a 1928 paper by the Russian physicist George Gamow. However, using alpha particles to transmute elements only worked in a few specific instances. Based on quantum tunneling, Cockcroft calculated protons at only 300,000 volts would penetrate and disintegrate the nuclei of light elements such as lithium. In 1929, he built a discharge tube to accelerate protons, but failed to disintegrate any nuclei. Another postdoctoral fellow at the Cavendish, working on similar lines to Cockcroft, was Ernest Walton, who had been attempting to crash electrons and heavy positive ions into light nuclei. Rutherford encouraged the pair to work together and gave them £1,000 to build a particle accelerator. The two scientists made a perfect team and put together an accelerator that looked home-made. (It was, including scavenged bicycle parts, glass tubes, food tins, and modeling clay). But it worked. The electrical transformer they built took low-voltage AC electricity and converted it to high voltage DC electricity – the maximum was about 700,000 volts, which was more than enough to accelerate protons to the necessary velocities. With this equipment, on the morning of April 14, 1932, Walton performed the first artificial nuclear disintegration in history, crashing protons at 400,000 volts into a thin sheet of lithium metal, splitting lithium atoms into fast moving helium nuclei (alpha particles). Cockcroft & Walton carried out further experiments, smashing protons, deuterons, and alpha particles into carbon, nitrogen, and oxygen atoms, producing radioactive isotopes such as carbon-11 and nitrogen-13. Cockcroft’s 1932 atom smashing experiments were his greatest achievement in research. He became a Physics lecturer at Cambridge, and in 1939, shortly before the start of World War 2, was appointed Jacksonian Professor of Natural Philosophy. During World War 2, he carried out radar research. In 1946, Cockcroft became Director of the UK’s Atomic Energy Research Establishment (AERE) at Harwell. In 1959, he became the first Master of the University of Cambridge’s new college – Churchill College. Cockcroft was knighted in 1948, age 51, becoming Sir John Cockcroft. In August 1925, age 28, Cockcroft married Eunice Elizabeth Crabtree, whose family were also cotton manufacturers. Cockcroft and his wife had been friends at their high school in Todmorden. Their first child died at two years old, after which the couple had four daughters and a son. Cockcroft was passionate about architecture and music. He was a quiet, calm man, admired for his even temper. Sir John Cockcroft died, age 70, at home in Churchill College, Cambridge, from a heart attack on September 18, 1967. "John Cockcroft." Famous Scientists. famousscientists.org. 20 Mar. 2018. Web.